Thong Sala Pier is the kind of perfectly functional island pier you'd expect an island-to-island ferry to arrive at. Located on the southwest of Koh Phangan, it's just 45 minutes away from Koh Samui. You'll notice the island's forested-mountainous terrain as you draw near. 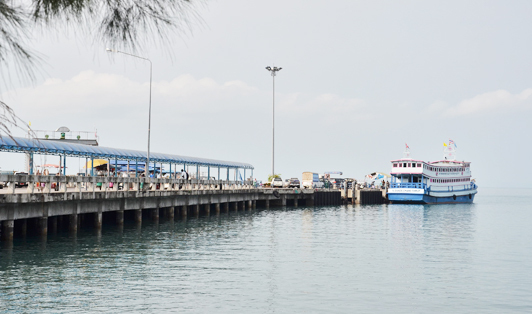 All of our PhuketFerry.com ferries will arrive here, and the docking procedure is about as straightforward as it gets. Stepping off the boat, you'll find a gaggle of taxi drivers and tour merchants, but don't panic. The fares are pretty standard, it's 100-150 Thai Baht to the infamous Ban Had Rin, for example. Maybe you can grab a barbequed corn-on-the-cob for the ride! Thong Sala itself is the main town of Koh Phangan, and as such, you'll find some banks, currency exchangers, local pubs, and a nice few restaurants. Many backpackers will stay around here for a night or two because it's a nice place, its close to the pier, and it's the absolute best connecting point to anywhere else on the island - yep, all roads lead to Thong Sala. There's a nice fresh food market that's open mornings and evenings, plus you might even get to see a bit of Thai boxing in one of the stadiums if you're lucky. Renting a motorcycle here for your stay is quite easy unless of course it's "Full Moon Party" time, but please be careful on these 'island' roads!